Kaki King has been described as one of the greatest guitarists playing today. For her most recent album The Neck is the Bridge to the Body she has been performing a show which includes a multimedia presentation being projected on to her guitar. 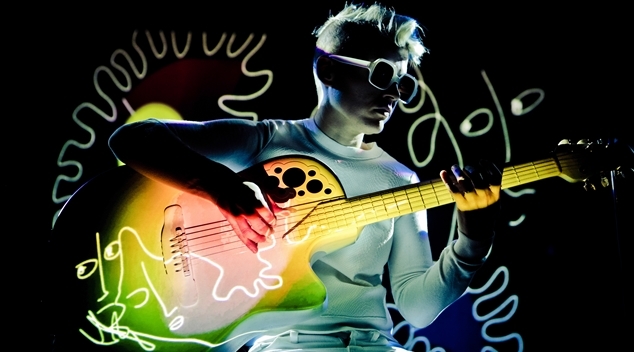 Kaki King chatted to OUTinPerth form her home in NYC late one night while she ate ice cream. How did the idea for combing your music with these amazing visuals come about? The strength of the show is really the vision mapping of the guitar, and turning the guitar into something visual, which it has always been for me. The guitar is incredibly powerful and expressive, it controls what you see sometimes, it’s quite surreal. It’s almost like it shouldn’t exist. I knew I had a the material to write a stage show, and over time it has morphed into a musical multimedia stage show. Does it lock you into a very set performance? There are set pieces, but I’m still performing live, and the longer I’ve been doing the show the more risks I take, the more daring I become. We’re all about making it as live and as exciting as possible. How would you describe your relationship with your guitar? I’ve been playing guitar for thirty four years, and my career has been fifteen years. In many ways it like a twin or a sibling, but there have been times when I’ve felt very antagonistic towards the guitar. I think what is part of the show that I’m touring is a sentiment that I’ve always felt, that the guitar – after you’ve written and experiments enough on it, it tends to guide you. The guitar when I write things on it and play it, then it tends to say ‘let’s try this’, ‘let’s have this chord change’, ‘let’s have this interaction’. It’s a guide and its very much in charge. I don’t mean that in a hokey spiritual way, it’s just how it appear to me. It’s the only thing I’ve had in my life that I’m any good at. Playing the guitar lets that part of my brain that is very noisy be quiet. I couldn’t live without it. No matter how long you play the guitar you’ll never stop learning how to play it, there’s too much to it, you’ll never master it. As a performer you’re well quite well known for just wanting to let the music speak, and you don’t tell a lot of stories and have audience interaction in your show. Does it surprise you that fans want to know about your personal life? Do they? I don’t know. I’m just very fortunate, really fortunate. I do feel that I have pulled off being able to have a career, and a fan base, without ever really being famous. It’s been awesome. There was certainly a time in my late 20’s where I felt exposed, but luckily for me I have been able to play music for a living,since I was twenty three, and I’ve never had the scrutiny really famous people have. If people are interested in my life they certainly don;t ask me to my face, they may see a photograph and see the back of my son’s head, but I’m pretty private on social media. The real fans, the people who know what’s up know that I’m just a normal person.